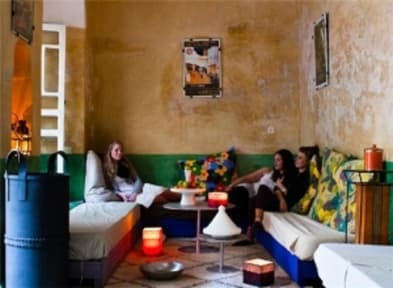 So Chic Riad v Marrákeš, Maroko: Zarezervujte nyní! 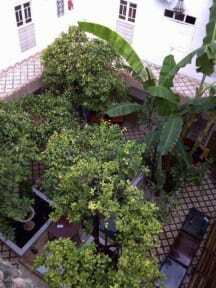 The house is a nice and relaxing Riad located in the medina of Marrakech a few minutes walking only from the main square Jemaa el Fnaa and the souks (markets). The house is composed of 7 double-triple-quadruple rooms each one equipped of an en-suite bathroom, (PLEASE NOTE THAT WE DO NOT HAVE ROOMS WITH A/C ) a central Patio decorated with Moorish furniture and a plunge pool in the center, a nice living room and an open air living room corner cool in summer time and very cosy during winter season. There is also a Hammam and a massage area as well as a very nice terrace well equipped for sunbathing. The kitchen is for staff only, please let us know if you have any special requests and we will do our best to assist. We ask that you are careful if you have henna paintings or similar as the henna can damage the towels and linen. Please send approx. arrival time so we can meet you on arrival. Changes and Cancellations made on arrival will be charged for the full amount as stated on your booking. Please allow 48 hours cancellation - prior to your arrival. Cancellations made less than 2 days before arrival we will keep the first night charged, cancellations made more than 2 days before arrival we refund the first night charged. please let us know your approximate arrival time after you receive your confirmation e-mail.